Freddy in March 2012 (left) and a photo taken in early fall (right). On April 3, 2012, DogTime ran a story about a stray Pit Bull puppy who was picked up off the streets of South Carolina by a good citizen. The poor pooch had been burned by caustic acid on his face, feet, and belly. The piece rightfully provoked outrage from our readers. The dog was taken to Noah’s Arks Rescue, a facility that specializes in abused dogs. Personnel named the pooch Freddy. 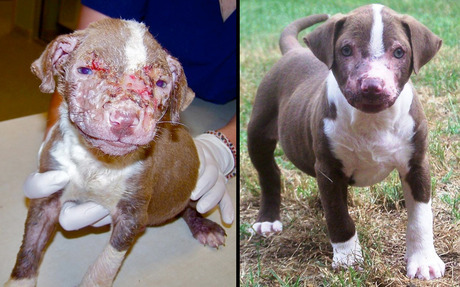 After months of battling infection and other ailments, Freddy recovered and was adopted. The Noah’s Arks Rescue website has the complete story.